If you are looking for a Bromeliad with outstanding foliage then Neophytum Galactic Warrior would be the one. This is hybrid between Neoregallia and Orthophytum and with narrow hard shinny leaves will show good variegation depending on conditions. It is one of the most attractive bromeliads and Neophytum Galactic Warrior will not be cheap as a mature specimen. Long sharp leaves with small spines, this is plant that will change colour with the season, or more correctly with the amount of sunlight. The more sun the more red in the foliage, and with poor light the foliage will tend towards green and yellow. 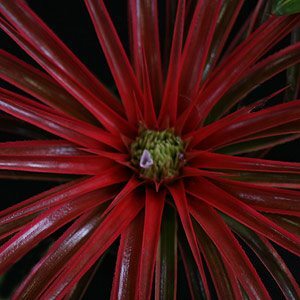 Good drainage is essential and care is similar to others, see bromeliad care notes. Try not to overpot and if you have not grown them before be a little patient when waiting for Galactic Warrior to flower. It may take around 5 years. How big can they get ? Around 1m in diameter in good conditions, sometimes larger. They do look great in a raised pot or container where the foliage can fall down a little. A little moisture during long dry period in summer, and a very diluted liquid seaweed foliar feed in spring is about all of the care required. Neophytum Galactic Warrior will flower with small purple to lilac flowers appearing in the centre of the plant usually in late spring. The two photographs published show the effect of sun on the foliage. The top photograph shows Neophytum Galactic Warrior with an intermediate amount of light. The lower with more sun. You will also find that as the plant matures the foliage will ‘flatten out’ to create a wonderful round pattern. 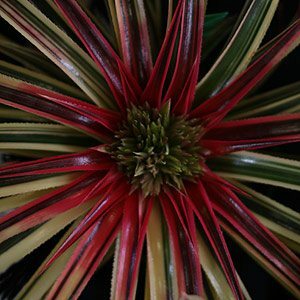 So from green through to red Neophytum Galactic Warrior is a wonderful Bromeliad, easy care and well worth seeking out.